I remember when I first moved to Los Angeles and I would get calls for various fitness auditions. My first one ended up landing me a spot as a background talent in P90X2, others were for fitness equipment, but some were to represent a diet or workout system to show a body transformation. The problem was the companies would fake the transformation photos. They would hire two different people for the before and after photo and pretend like the system worked in no time. Being young and naive at the time I found this to be such a shock and so disheartening. It's no wonder so many people try these quick fix systems and are left disappointed and frustrated. They may keep looking for a different route to take, but the problem is the map they are relying on is false and the compass they have been given is broken. What I know for sure is that there are no shortcuts when it comes to body transformations, breaking through plateaus, or achieving any sincere heartfelt goal or desire. What I learned on my pilgrimage abroad is that transformation is an inside out process. Even though you can't see it on the outside, change is happening on the inside in each of us all the time. It's like when seeds are planted in the earth. For weeks you may see no changes as all the growth is happening beneath the surface, but with the right conditions eventually the seedling breaks through the earth and blooms in all its glory. That seedling has an innate intelligence all it's own for growth, and we too obtain that same intelligence. I find the most difficult part of any new journey to be trust in the process. Once you plant the seeds and start taking actions to nourish the seedlings you can't keep digging them up to see if it's working yet or they will never take root. The trillions of cells in our body are constantly in a cycle of death and birth. The health of these cells depends on what you do, what you eat, the environment you hang out in, the people you interact with, and mostly what you think. These experiences shape us and transform us on every level. Do you ever wonder what you would be like if you grew up in a completely different culture and environment? How would your values be different, your body and abilities, your preferences and aversions? 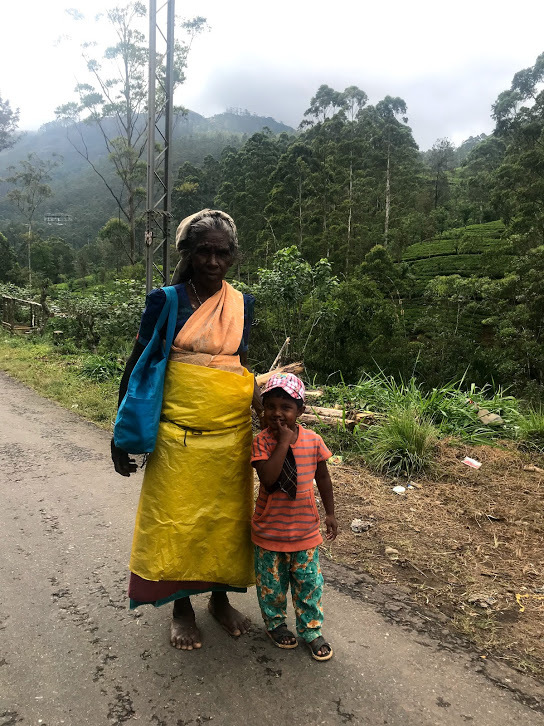 Above: A young boy and his Grandmother in Sri Lanka taken this past March. There's an old fable about a lion cub who lost it's mother and was adopted by a herd of sheep. The lion cub grew up just as if it were a baby lamb. One day a grown lion looked out over the field and was bewildered to see this young lion acting like a sheep. When the lion approached the youth he tried to remind him that he was king of the jungle, not a wee little lamb. The cub was in denial. He truly believed he was one of the sheep. With much training the cub eventually realized his strength and joined the pack of lions. The takeaway from this story is that sometimes we don't know our own strengths until someone pulls it out of us or reminds us who we really are. It's like the 4-minute mile story. Once Richard Banister broke the 4 minute mile barrier in 1954 others began to do the same. The limitation was not in the physical body. It was in the mind. First, we must believe it's possible to make the shift. The body will follow what the mind believes. The mind is a fabulous cinematographer. Sometimes the mind movies are romantic comedies, sometimes melancholy, other times frightful and they have you sitting on the edge of your seat. The images we see in our minds can motivate us or crush our dreams...if we believe them and react to them. Spend time observing what movies your mind is creating on a daily basis. Are they useful or just a distraction? When you are calling in a goal, a dream, a transformation it's not just helpful, but essential that you feel it (and express gratitude for it) as if it's already happened. About 10 years ago I first read Arnold Schwarzenegger's memoir The Education of a Bodybuilder. What I have never forgotten is what he said about the way he felt when he would touch iron. It was like an energy that ran through him. He knew from a young age what his goals were and he never stopped the pursuit until his goals were accomplished. Everyday he trained he didn't do it because he felt like he had to. He wanted to, he loved the journey even more than the destination, and that's what makes all the difference in the world. For more on how to reprogram your mind for results see this article I wrote. Once you have your mind right it's essential to align all the variables. There's a different way to train and eat for building muscle and losing fat versus performance goals like running a marathon or competing in an iron man triathlon. There are different elements you will need for certain skills like the pistol squat or handstand. Each person is built differently and requires different methods and techniques. There are unique challenges you will face whether you are a busy Mom or Dad or an executive with a full on travel schedule. The key is align what you do, how you eat, and how you think towards your goals. If you need help with this it's my specialty! Check out my coaching page. Often times we want to jump ahead to the complex, the fun stuff, the things we read about in magazines or see on fitness videos, but ignore the fact that each of our bodies have been so kind to carry us through this life up to now and may need some maintenance work before you can get back on the course going full speed. Mobility, a balance of strength and flexibility, is the precursor to high level training. There is absolutely no substitute for practice. This is the law of specificity. If you want to get better at a skill and induce changes you must practice (correctly) to induce neurological changes. Through practice you rewire yourself and become your vision. To get moving towards your goals today contact me. I would love to hear from you!